Elaborate white lace adds just the right touch of romance to these otherwise rustic save the dates. 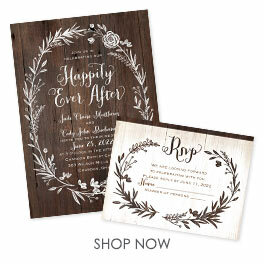 A burlap pattern creates the backdrop for your wording, which is printed in white in your choice of fonts. Envelopes are included. Make these into save the date magnets with just a simple upgrade in paper. Size: 6 1/4" x 4 5/8"
Personalization Options: Your choice of ink colors, fonts and wording. Your choice of photo. Design available only as shown.